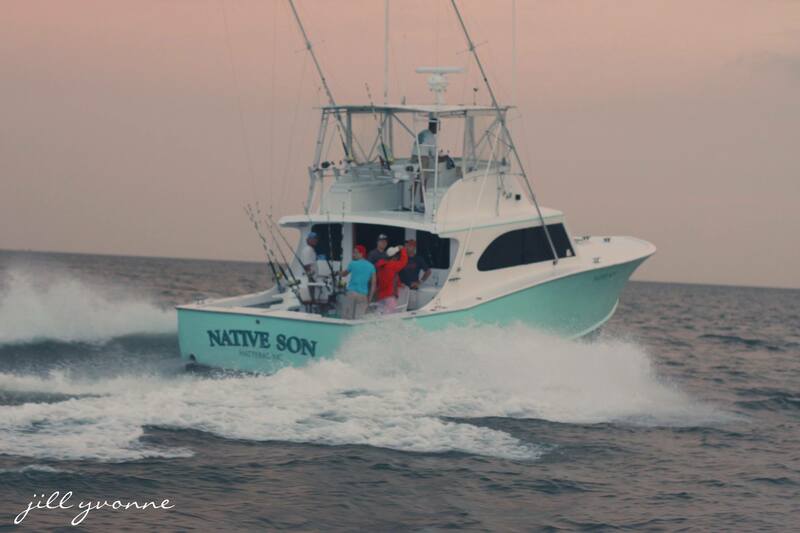 The Native Son is a 48 ft. custom Carolina boat built by Captain Sheldon Midgett of Wanchese, NC. She is powered by a 10 cylinder 825 horsepower Daewoo diesel providing a smooth, comfortable 23 knot cruise to get you to the fishing grounds more quickly. We fish the deep water off Hatteras North Carolina in the Atlantic Gulf Stream. Join us for amazing Marlin, Tuna and Dolphin fishing. The large salon provides ample room to stow your gear while relaxing comfortably in air conditioning on the way to and from the fishing spots. She is equipped with the latest electronics including a new Furuno color chart plotter, 1000 watt bottom machine and 36 mile radar. The Native Son has all Coast Guard required safety equipment on board. You will find a wide variety of tackle onboard the Native Son. Whether you like to fish light tackle or don’t want to work that hard we have the tackle to handle it. We have Penn International 30w’s, 50w’s, 80s and 80w’s as well as 50sw’s, 80stw’s and 130st’s, which are all two speed reels. We also have Shimano TLD 20’s and 25’s up to Shimano Tiagra 50w’s. The Native Son has a large cockpit with a three chair layout including one 130lb. Murray Brothers fighting chair and two smaller sailfish chairs. If you are into standup fishing, don’t hesitate to ask; we have some gear for that too. Ready to book your charter? Questions about off-shore charter fishing aboard the Native Son? Use the contact form below to contact the Native Son with your booking request or questions. We look forward to hearing from you. Copyright Native Son Sportfishing © 2018. All Rights Reserved.